Boston Bruins forward David Pastrnak has been suspended two games for his illegal check to the head of New York Rangers defenceman Dan Girardi. The hit took place on Wednesday night in the second period of Boston’s 5-2 loss to New York, with Pastrnak assessed a minor penalty on the play. Girardi was eligible to be checked on the play, but the Department of Player Safety pointed out that the “main point of contact” was the head. It’s also worth noting that Girardi’s head did not change location prior to the hit. Essentially, this is an open and shut suspension. Girardi returned to the game after leaving for a brief period of time and he played over six minutes in the third period. This is Pastrnak’s first run-in with the Department of Player Safety. The 20-year-old has been off to a rip-roaring start this season, with eight points in seven games – including five goals and three assists. He’ll be eligible to return on November 3 in a game against the Tampa Bay Lightning. Pastrnak will sit games against the Detroit Red Wings and Florida Panthers, so the Bruins will have to make some adjustments. The forward has been on the top line with Brad Marchand and Patrice Bergeron. 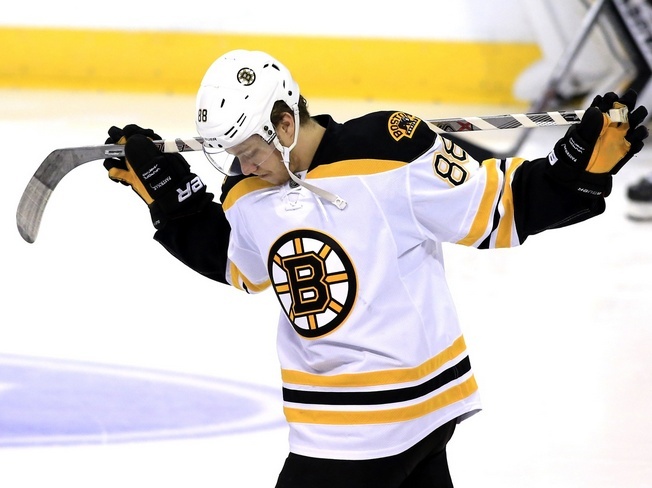 Pastrnak will cough up $10,277.78 in salary as per the collective bargaining agreement.